At Adzuna, it’s safe to say we know our way around a job advertisement. At any one time, we have up to 140,000 job ads on our site. Some are fantastic, others, not so much. What is it that makes a job advertisement so tantalising to job seekers that they can’t help but click the golden “Apply” button. We put together a template to help you write the perfect job ad. This is the single most important part of the job ad. Think about this the same way you would a Google search. What is the most likely keyword a jobseeker would use to search for the position you are advertising? For example, if you are recruiting for a bartender position, the job title should be “Bartender”, not mixologist, cocktail connoisseur, or wine legend. What is the likelihood people looking for bar tender positions will use those terms? Adzuna hot tip: Job ads that include the salary in the title attract 20% more clicks. 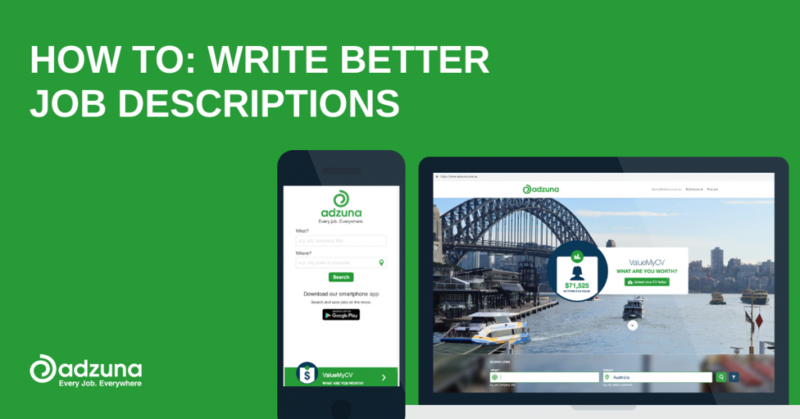 Adzuna hot tip: Include the location of the job in the title. Job seekers want to know this information up front. We recommend writing a clear, concise list of skills required to be successful at the job. Once again, use keywords that jobseekers will be familiar with and not vague skills. Adzuna hot tip: List the skills in dot points. They are easier to read. Write a clear list of the main tasks that will be undertaken. After listing the responsibilities, write a short blurb (no more than 150 words) about the position. This is your chance to give job seekers insight into the culture and working conditions. Adzuna hot tip: Include whether the position is full-time or part-time. This will ensure better quality and more suited applicant applies. Mix cocktails for busy CBD bar. Maintain an accurate cash drawer throughout the night and be able to account for any and all discrepancies. Ensure all drinks are created using the correct serving sizes outlined in the business manual, so as to keep costs down. Work at a steady pace to ensure customers are kept happy and satisfied. Deliver a consistently high level of customer service and adhere to all RSA guidelines to ensure the bar environment is safe. Our employees possess a passion for thriving under pressure whilst maintaining the highest level of service, in an expanding company with busy and exciting times ahead. We are on the hunt for experienced and enthusiastic bartenders sts who have a true passion for the hospitality industry. Need help writing a job description for a specific role? Speak to us today if you’re ready to hire, post your job on adzuna. Tagged under: adzuna,	hiring,	recruitment. Look Past The Resume. How To Choose The Best Candidates.